Trojan Family Magazine recently put a spotlight on arts education in Los Angeles, as championed by a number of USC educators, including USC Thornton faculty and alumni. The article, “The Trojans Bringing Arts Education Back to Kids and Schools,” points to Peter Webster, Thornton’s Scholar-in-Residence and Vice Dean of Division of Scholarly & Professional Studies, as an innovator in the field of music education. Under Webster, the Music Teaching & Learning department recently launched new master’s degrees in Community Music and K-12 Contemporary Teaching Practice, emphasizing ideas in music education that respond to California student’s evolving interests and needs. 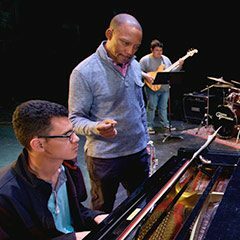 The article also highlights the success of Thornton alumnus Vince Womack (MMED ’97 — Previously profiled here) whose innovative curriculum as music director of the James A. Foshay Learning Center in South Los Angeles allows his students to explore a variety of different musical experiences. “It’s easy to be a pop music aficionado, but that doesn’t necessarily feed into you nurturing that individual thing that you are,” Womack said, noting that it can take time for students to find musical experiences that truly inspire them.